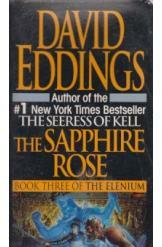 The Sapphire Rose Book Three of the Elenium by David Eddings. Book in a good condition, all pages intact. The knight Sparhawk now possesses Bhelliom and restoring Queen Ehlana would be the begining of Spahawk's mission. He must thwart Ehlana's poisoner and his plot.